Rhizosphere of tress that accumulate phosphorus in the Brazilian Amazon. Relationship between fish community and riparian vegetation cover in hydrological periods (Coffee-growing region, Colombia). Annotations on the feeding ecology of black howler monkeys in an overcrowded fragment in Balancán, Tabasco, México. 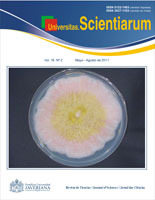 Assessment of enzymatic characterization of Fusarium spp. isolated from human, animal, and plant wounds.